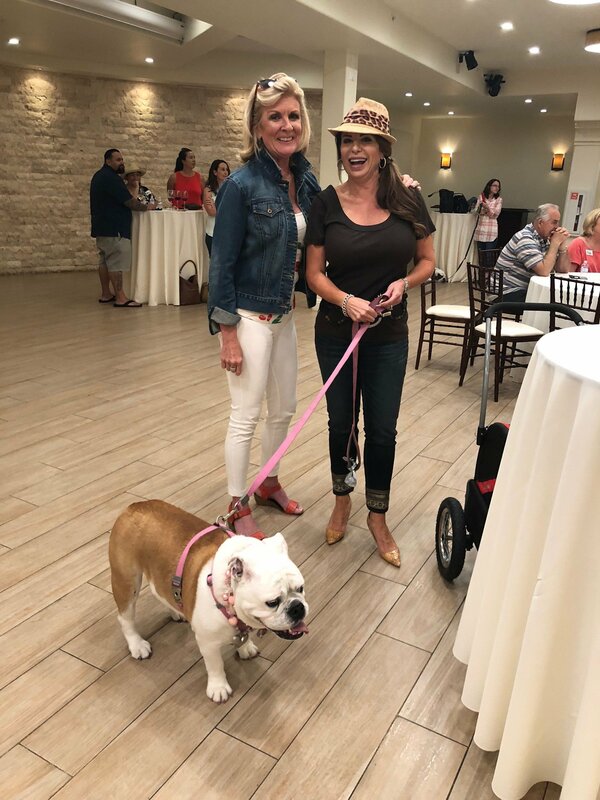 In the heart of historic San Juan Capistrano, bulldogs, their owners and dog lovers joined together to support the Southern California Bulldog Rescue on June 2 at Sundried Tomato. For its sixth consecutive year, “Bullies Uncorked” was hosted by Rancho Santa Fe resident and philanthropist Holli Lienau. Nearly 100 guests were in attendance and more than $11,000 raised. An avid animal lover, Lienau also has a soft spot for English bulldogs. She already had three dogs of this breed. Her 3-year-old bulldog, Miss Matty, was a rescue from Southern California Bulldog Rescue. Lienau said the nonprofit partners with another organization named poundWISHES, which assists shelters and rescues with helping find dogs their forever homes. Lienau describes bulldogs as unique. Yes, they can be strong-headed and pushy, but they are also sweet and very affectionate, she said. The co-founder and director of the organization, Skip Van Der Marliere, was on hand enjoying the day. Established in 1997, Southern California Bulldog Rescue saves between 400 to 450 bulldogs per year. While Southern California Bulldog Rescue is in Orange County, Van Der Marliere said it branches out to San Diego, to the borders of Arizona and Nevada, and stretches up toward Visalia and Fresno. Van Der Marliere said “Bullies Uncorked,” is a popular wine event with appetizers and fabulous food. The organization relies on fundraisers since it does not have a steady revenue of income. “Bullies Uncorked is one of our star events,” he said. Like Lienau, Van Der Marliere said he also gravitated to bulldogs. Bueno Bueno Mexican Kitchen provided food for the afternoon soiree. In addition to wine tasting, sangria, hors d’oeuvres and adopted bulldogs with their pet parents, silent auction and live auction items were sought after. Three live auction experiences were gifted from Lienau, founder of the organization, “Holli” day … Any day! Lienau is hosting all three events. The first live auction item was a Baja California Wine Tasting and Food Pairing Party at San Juan Capistrano’s Bueno Bueno Mexican Kitchen. “This is a private wine tasting which will feature premium wines from Baja’s premier wine growing region, Valle de Guadalupe. Local Baja ambassador, Fernando Gaxiola, will lead us through a selection of fabulous wines and Bueno Bueno will provide their deliciously paired appetizers,” Lienau said. The other two live auctions, which went for more than $2,000 apiece, take place at Lienau’s vineyard in Rancho Santa Fe. Guests will be picking Sangiovese, Cabernet Franc and Petit Syrah grapes. Lienau said everyone loves to come to her vineyard and pick grapes. In fact, they ask her to come, she said. “I’m like, OK, ‘You can pay to come and sweat in my yard and harvest grapes,’” Lienau quipped, adding how most times it’s a warm morning, but great fun and an afternoon of wine and pizza as a reward. While the auction winners are having a good time this harvesting season in September, Lienau will remind them of the fact that their generosity helped bulldogs in need.